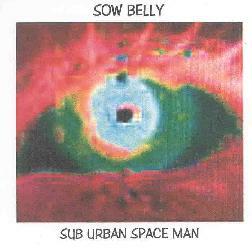 Sow Belly - "Sub Urban Space Man" / "Flight Check"
Red Nail Music is a mainly CD-R based label from Morgantown, WV. 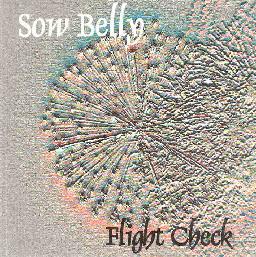 They have released more than 80 releases now, including 5 by Sow Belly. Sow Belly is a one man project by Greg Whitmore (I think??) from North Carolina. Sub Urban Space Man was released last year and Flight Check is coming out very soon. Sub Urban Space Man is a space rock project with some guests helping to write some of the songs. The "Sub Urban Space Man" opens the CD with some cool space rock riffing ala Farflug, Pressurehed, Hawkwind, and Jet Jaguar. "It’s You" goes more into the ambient space music realm. "Shine" starts off that way but then some very spaced out vocals and a phased out guitar-synth sound takes over. Very Hawkwind inspired this one. "Fishies" is one of the stand out tracks of the CD. A really cool floating song. "Bring Back the 20th Century Fox" is another ambient space trip. "Lost my Wallet" has some nice organ sounds and space generator noises. "Space Man Reprise" closes the CD. There are so many great ideas here in the music and if this was recorded with a full band with real drums and bass, it would make such a huge difference. Over the course of a whole CD I tire of electronic percussion in a rock setting. The difference a real drummer makes is quite remarkable. Flight Check is very different from Sub Urban as it is all electronic, no guitars and starts with a electronic based rhythm track (ok, all the songs have programmed drums). Some of the tracks are quite short and this is mixed with tracks 9-10 minutes long. "Flight Check A-Go-Go" is the first long track and starts with some space sounds and piano before picking up. It is sort of spaced and groovy. "Time Slip" is a strange sound collage running on top of a repetitive deep synth line. "Midnight Carnival" is a strange organ piece that comes across as an unfinished piece at only 1 minute long. "Auto Pilot" is a dark sounding song with a throbbing bass line and sharp loud electronic drums upon which the spacey keyboards are layered. Bend is another short organ based piece. "This Flight Has Been Cancelled" is an ambient space song. "Dolphins" ends the CD with more ambient space music. For more information you can email Sow Belly at sowbelly@hotmail.com. Visit the Red Nail Music web site at: http://www.rednailmusic.com. Hear Sow Belly at their Mp3.com web site at: http://www.mp3.com/sowbelly.